Rescue teams, including fire squads, were dispatched to the accident site. Istanbul Mayor Vasip Şahin confirmed that a total of seven people were on board the crashed aircraft, which belonged to the Turkish industrial Eczacıbaşı group, including two pilots and four foreign guests of Russian origin. The crash took place at 11:21 a.m. local time when the Eczacıbaşı helicopter was heading from Istanbul to the group's Bozüyük facilities, located in the northwestern Turkish province of Bilecek, for a meeting scheduled at 12:00 p.m. The impact moment of the crash was caught on the camera of a nearby service station; the footage shows a big explosion followed by the rise of a smoke cloud. Eczacıbaşı Vitra Russia's CEO Salim Özen and four Russian guests were on board the helicopter when it crashed. Bülent Eczacıbaşı, head of the Eczacıbaşı Holding, said the aircraft was carrying a Turkish executive, Russian guests and two pilots and added that the helicopter was fully-equipped and in good condition. 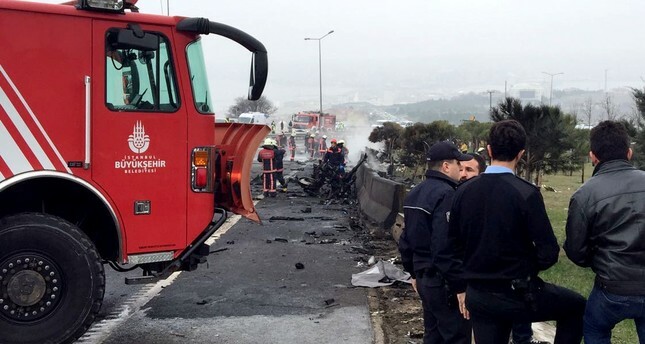 The ministry of transportation confirmed in a statement that the vehicle hit a television tower, as heavy fog lied over Istanbul, before crashing on the E-5 highway. The four Russian passengers were later identified as Aleksandr Vanin, Igor Kochergin, Luidmila Chuprova and Elena Badragan.